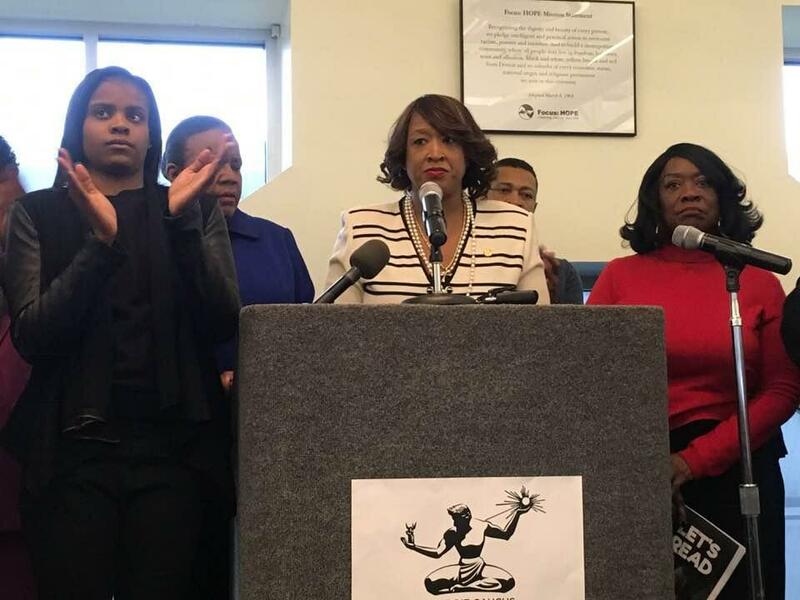 Detroit leaders decry police Snapchat video, vow to fight "disrespect and discrimination"
Some of Detroit’s black women leaders are rallying behind the young woman who was taunted on video by two white police officers—and calling for some bigger changes at the Detroit Police Department. State Representative Sherry Gay-Dagnogo organized the event that brought some of the city’s state legislators and other officials out to support Ariel Moore. Ariel Moore, left, as Detroit State Rep. Sherry Gay-Dagnogo, center, speaks Friday about the police incident involving Moore. Gay-Dagnogo called Moore “our daughter,” and says she wanted to show black women uniting behind her. Craig has suspended the officers with pay, pending an investigation. Gay-Dagnogo said lawmakers plan to set up a committee to monitor the 6th Precinct, where Steele and Garrison work. She also called for mandatory mental health assessments and cultural sensitivity training for officers, as well as a thorough assessment of all Detroit police personnel. Gay-Dagnogo pointed out that Steele had served probation for domestic violence and unlawful discharge of a weapon in 2008. Gay-Dagnogo also called on Craig to address larger racial issues within the department. Days later, Craig disbanded the CORE committee, while saying he would move forward with implementing some of its recommendations. Moore attended the event with her family and an attorney. She later declined to comment to reporters, but the family reportedly plans to file a lawsuit over Moore’s encounter with the police. Detroit ombudsman: City needs a plan for "Ferguson-like incident"
Detroit’s ombudsman says the city should have a plan in place to prevent racial incidents from blowing up into civil disturbances. Two Detroit police officers are under investigation for allegedly making racially demeaning comments during a traffic stop. Officer Gary Steele and an unidentified officer stopped Ariel Moore last week for driving with an expired license plate. Moore's vehicle was seized by the officers.